Please note that Disney Rewards are not available in the US (only available in the UK). Toy Story There is greatness in a film that can be discussed, dissected, and talked about late into the night. Then there is genius that is right in front of our faces--you smile at the spell it puts you into and are refreshed, and not a word needs to be spoken. This kind of entertainment is what they used to call \"movie magic\" and there is loads of it in this irresistible computer animation feature. Just a picture of these bright toys on the cover of Toy Story looks intriguing as it reawakens the kid in us. Filmmaker John Lasseter's shorts illustrate not only a technical brilliance but also a great sense of humour--one in which the pun is always intended. Lasseter thinks of himself as a storyteller first and an animator second, much like another film innovator, Walt Disney. Lasseter's story is universal and magical: what do toys do when they're not played with? Cowboy Woody (voiced by Tom Hanks), Andy's favourite bedroom toy, tries to calm the other toys (some original, some classic) during a wrenching time of year--the birthday party, when newer toys may replace them. Sure enough, Space Ranger Buzz Lightyear (Tim Allen) is the new toy that takes over the throne. Buzz has a crucial flaw, though--he believes he's the real Buzz Lightyear, not a toy. Bright and cheerful, Toy Story is much more than a 90-minute commercial for the inevitable bonanza of Woody and Buzz toys. Lasseter further scores with perfect voice casting, including Don Rickles as Mr. Potato Head and Wallace Shawn as a meek dinosaur. The director-animator won a special Oscar \"For the development and inspired application of techniques that have made possible the first feature-length computer-animated film\". In other words, this movie is great. 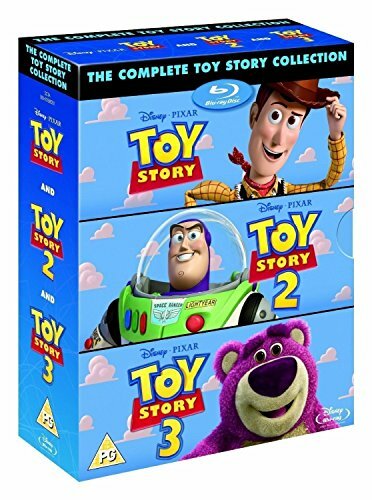 --Doug Thomas Toy Story 2 John Lasseter and his gang of high-tech creators at Pixar create another entertainment for the ages.